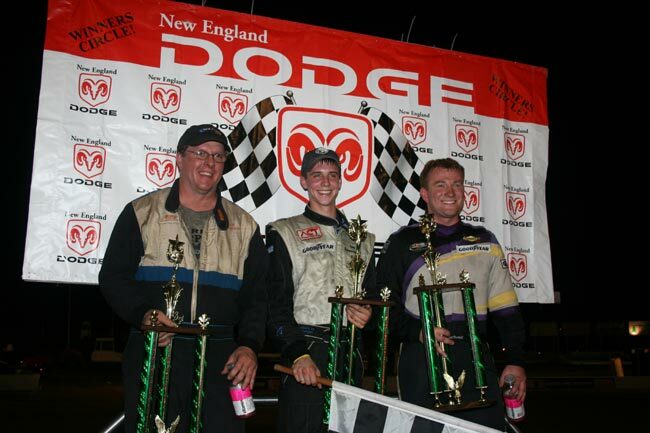 OXFORD, Maine - Ricky Rolfe and Eddie MacDonald provided much of the entertainment value with their two- and three-deep drive through traffic Saturday night, but 19-year-old Joey Polewarczyk Jr. otherwise dominated the Dunkin' Donuts 150 for his second American-Canadian Tour victory of the season. 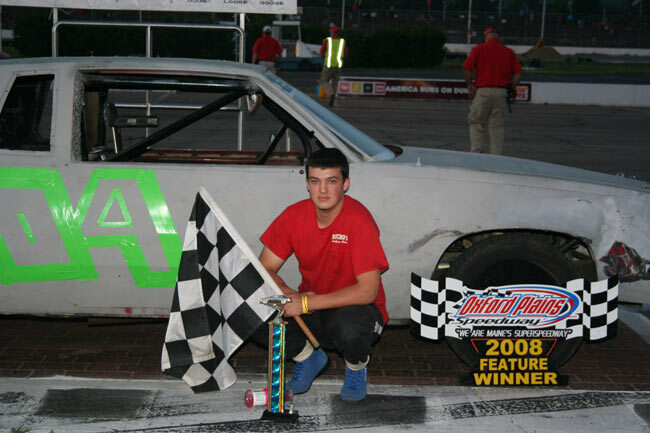 Polewarczyk posted his first career win at OPS after two previous top-five performances in his brief but promising career. "We changed a lot of stuff in practice. We didn't find anything, but we changed everything, so apparently we fixed something." Whatever the combination, it worked. Polewarczyk charged from his seventh starting position and snagged the lead from series point leader Scott Payea on lap 53. 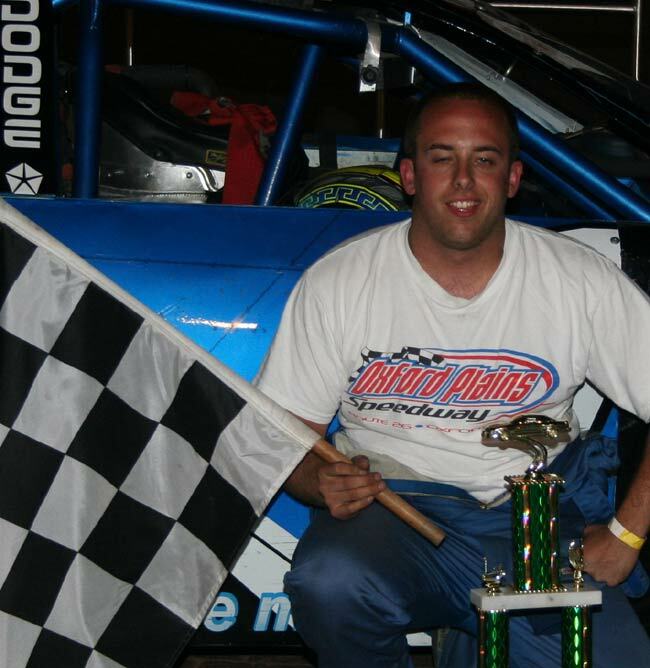 Rolfe, the winner of two straight 40-lap weekly Oxford Networks Late Model features and the season-opening New England Dodge Dealers ACT 150 at Oxford, made a dramatic drive from 17th to second during the first half of the event. The two-time OPS champion closed Polewarczyk's lead to about four car lengths prior to the first of only two caution flags in the race on lap 104, for a single-car spin by Payea. It was the youngster getting the jump on the restart, though, actually extending his lead to almost a full straightaway prior to the second yellow with a dozern laps remaining. Given a four-car buffer zone of lapped machines between himself and Rolfe, Polewarczyk cruised. In fact, it was MacDonald making a jaw-dropping drive around double-wide lapped traffic to catch and pass Rolfe for second on lap 147. 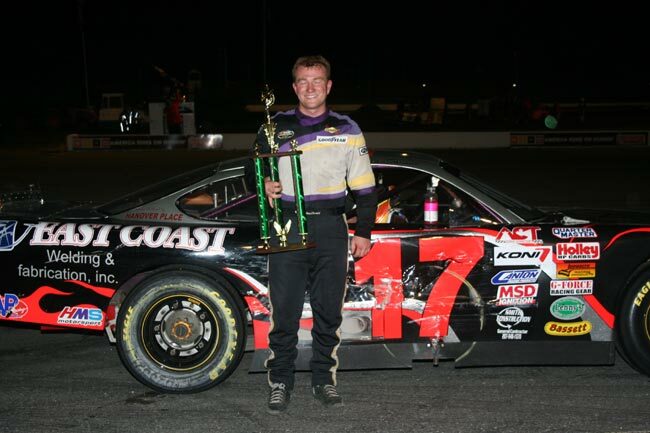 MacDonald set out his East Coast Welding and Fabrication #17 to the outside rim of the track and took full advantage of the second and final yellow flag for a spin by reigning TD Banknorth 250 champion Roger Brown. "The car was great on the outside. The outside groove really worked good tonight," said MacDonald, who will compete in at least three different touring series this summer. "Rollie (MacDonald, crew chief) got the car going on the outside again. He does a great job. I just love racing here. Joey did an awesome job." Rolfe was the star of the show prior to the Payea spin. His car blistered most of the competition on the long early run, and he worked lapped traffic with consummate veteran skill. Perhaps too well, he later admitted. 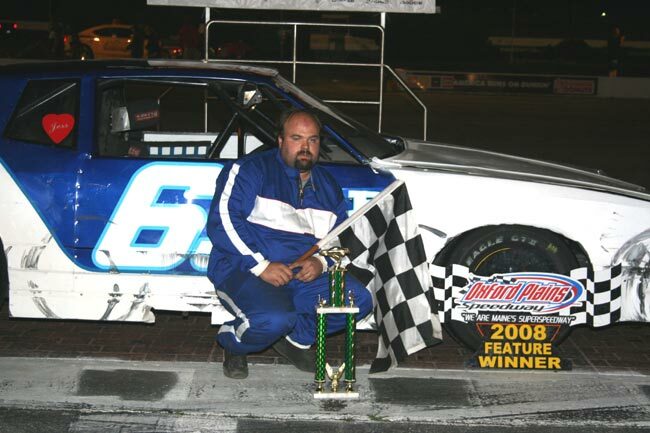 Rolfe passed the likes of Brent Dragon, Jean-Paul Cyr, Ben Rowe and Patrick Laperle as if they were coasting around the historic 3/8-mile oval. After 30 laps of qualifying and nearly 100 in the finale, however, Rolfe essentially used up his J. Jones Construction/Swasey Excavation #51. 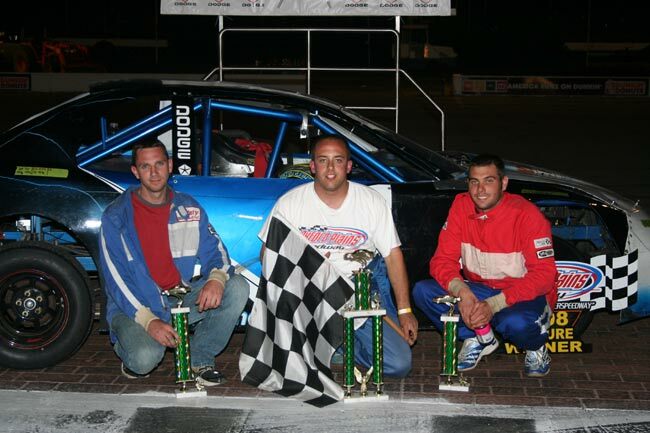 Cyr chased Rolfe to the checkered flag in the spring ACT race, nearly taking away the win. Rolfe couldn’t summon that kind of challenge for Polewarczyk, losing ground each lap during the second extended green-flag run of the event. The race was the final long distance tuneup for the 35th annual TD Banknorth 250 on Sunday, July 20. 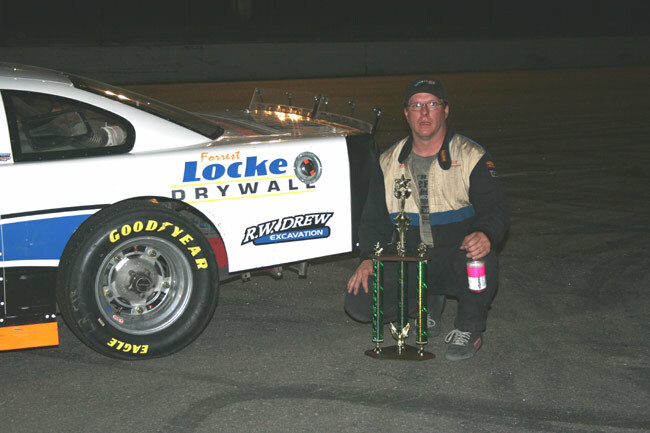 Canada’s Laperle and ACT rookie/Oxford graduate Glen Luce rounded out a diverse group of drivers in the top five, followed by Rowe, Payea, Dragon, Cyr and Scott Robbins. 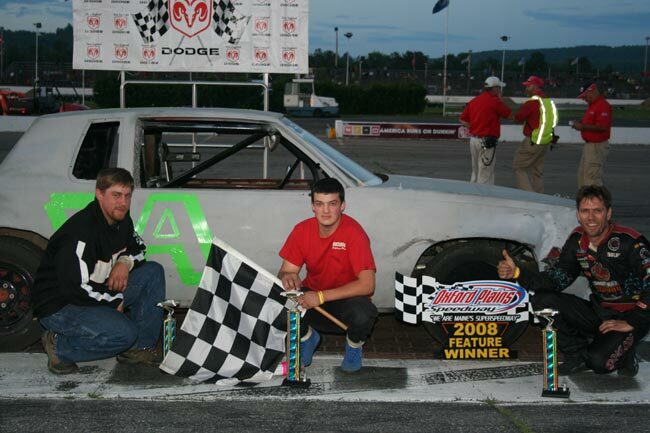 Both MacDonald and Rolfe qualified for the Dunkin' Donuts 150 by winning consolation races. Polewarczyk won his 15-lap heat race and started seventh in the main by virtue of his plus-minus seeding from the qualifier. Rolfe and MacDonald each missed out by one spot in the first round after starting last in their respective heats. Fifty-one cars attempted to make the starting grid of 33. All but one starter was running at the finish. Eleven finished on the lead lap. 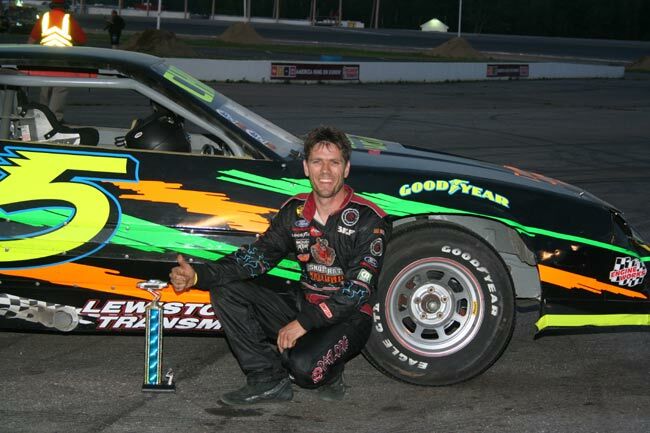 The win was Polewarczyk's first top-10 finish on the tour since a triumph in April at his home track, Lee USA (N.H.) Speedway, in the Governor's Cup. Crashes and mechanical problems placed Polewarczyk close to the rear of the finishing order at four other events. He failed to qualify for another. "The beginning week was awesome, but then after that it was pretty bad. We had fast cars everywhere, but things just didn't go our way," Polewarczyk said. "It certainly went our way tonight." 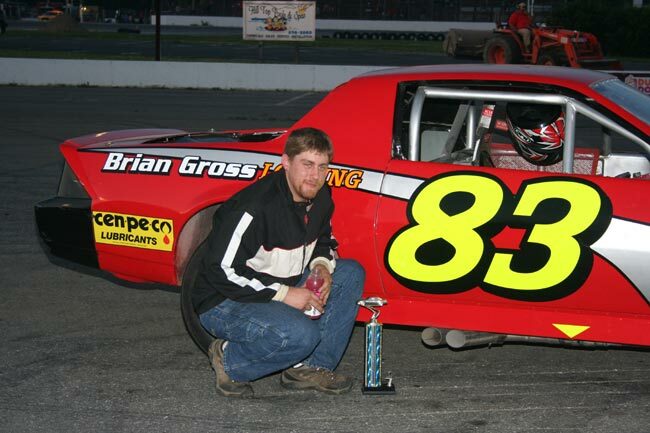 In accompanying feature action, Matt Williams made himself 2-for-2 on the supporting card of ACT main events this season by winning the 30-lap Allen's Coffee Flavored Brandy Strictly Stock feature. 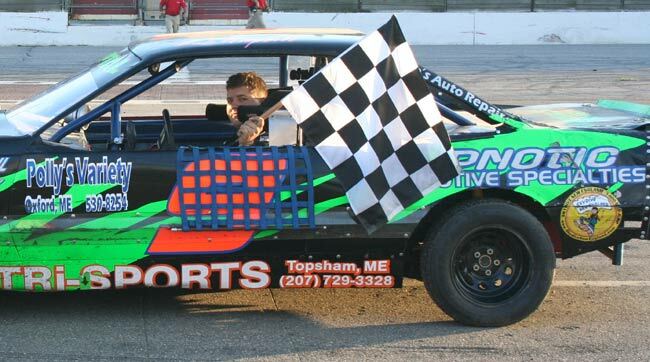 Justin Karkos completed a triumphant return to his home track with a convincing Allen’s Mini Stock victory, his first in three tries. 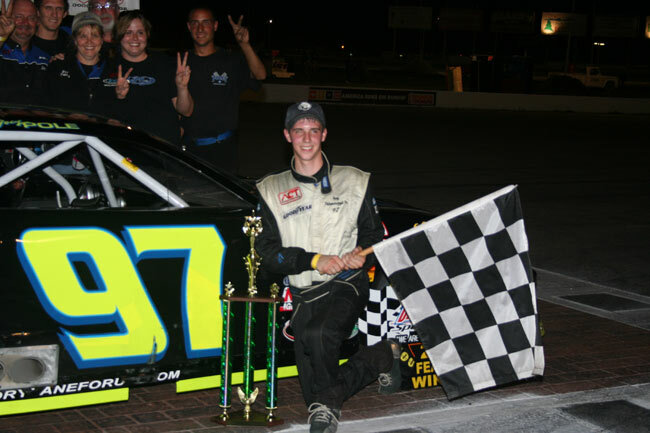 Zach Bowie backed his first career win Wednesday night with another on Saturday, this time in the Chimney Tech Outlaw division. Bowie padded his Agren Appliance Saturday Showdown point lead in the process. Dottie Patria did the same, sailing to her fourth Allen's Ladies victory of the season. Williams took advantage of lapped traffic, trapped early leader B.J. Chapman on the outside and scooted into the lead with seven laps remaining. Chapman and Mike Short spun over the first turn on the next lap, leaving Williams with a spacious lead in the R.W. Plumbing #63. Glen Henderson and Skip Tripp were left to duke it out for second after playing a friendly game of bumper tag for fourth throughout the middle stages. Henderson had the preferred spot at the head of that battle and wound up in the runner-up role for the third time this season after three wins a year ago. “My crew works on that car hard and faithfully every week. I hope that was a good show. That’s the way racing should be,” Henderson said. Tripp’s team continues to chase the set-up that earned him back-to-back wins on May 3 and 10. Although he put the R.P.M. Racing Engines/Waste Management #12 into the top three for the second straight week, Tripp is encountering tougher competition as spring turns to summer. 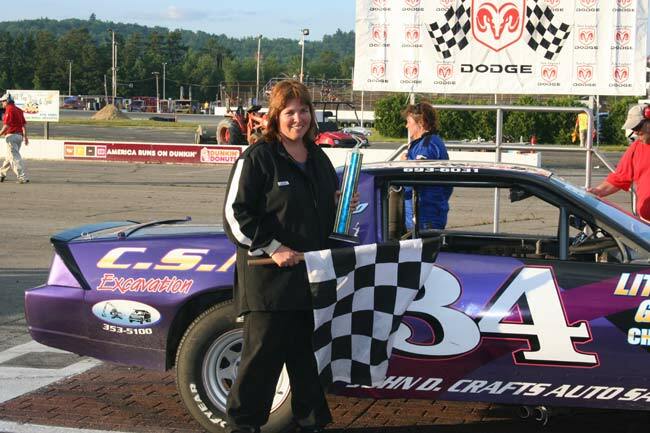 Kim Tripp returned from a month out of the driver's seat to finish fourth. Rick Thompson was fifth in Tommy Tompkins' #113, borrowed after Thompson's #07 suffered engine failure in practice. 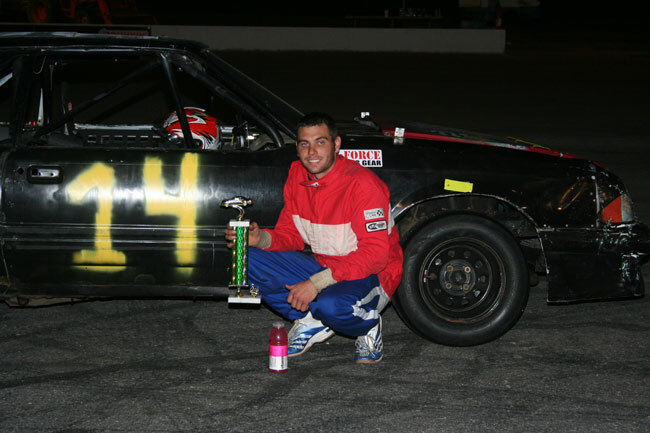 In only his third start since returning to full-time competition at his home track, Karkos dominated the 30-lap Allen's Mini Stock feature. 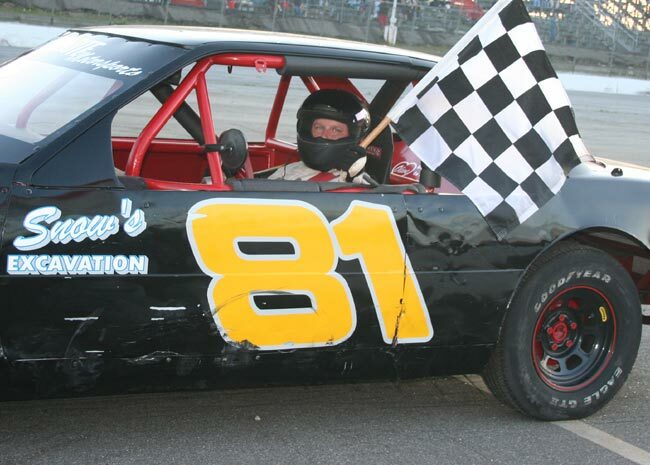 Karkos was one of several drivers who produced an amazing 11 lead changes in the Allen’s 100 last week. Issues underneath the hood relegated him to 10th place in that one, but the resulting low handicap provided him a prime starting spot and a runaway win in his return engagement. 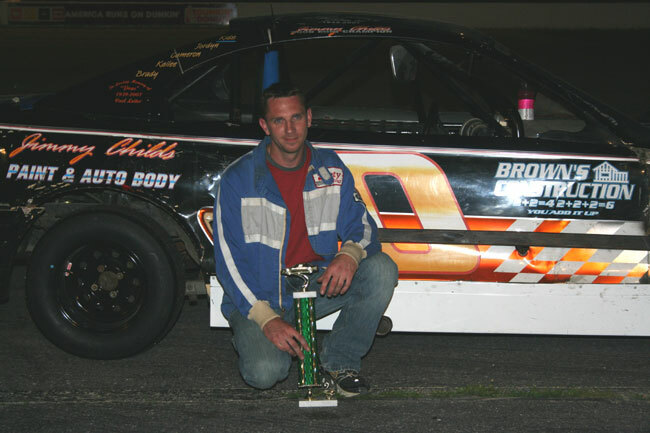 Childs charged from the rear of the field to runner-up honors for the second time this season in a relief role for his dad, Bill Sr. It’s the same Wolf’s Den/Brown’s Construction #10 that Jimmy drive to 2006 and ‘07 Mini Stock championships before embarking on a Late Model career. 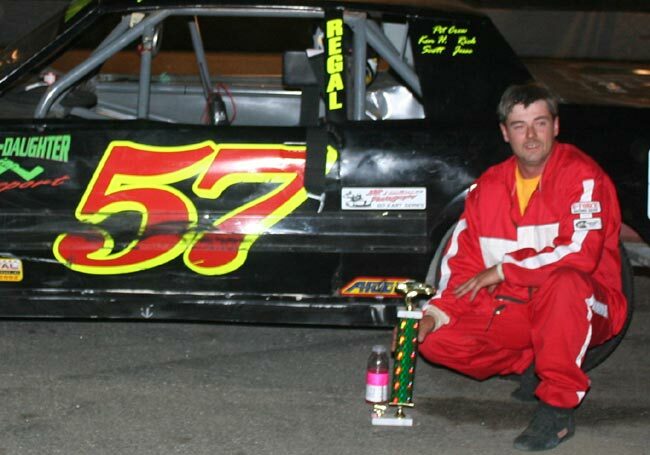 Bill Childs Sr. also finished second in last week’s 100-lap marathon, one week after a hard impact with the front stretch wall. As the chief mechanic on his father’s ride, Jimmy takes the close-but-no-cigar distinction to heart. Matt Moore finished a distant third, safely ahead of cousin and point leader Darrell Moore. Bob Guptill was a solid fifth after a heat race win. Bowie steered David Walker’s Renegade to his breakthrough win Wednesday. He was a strong third in the Outlaw battle that night. This time out, Rodney Englehaupt, Randy Robitaille and Dan Brown only kept the Outlaw lead warm while Bowie bolted from the back. 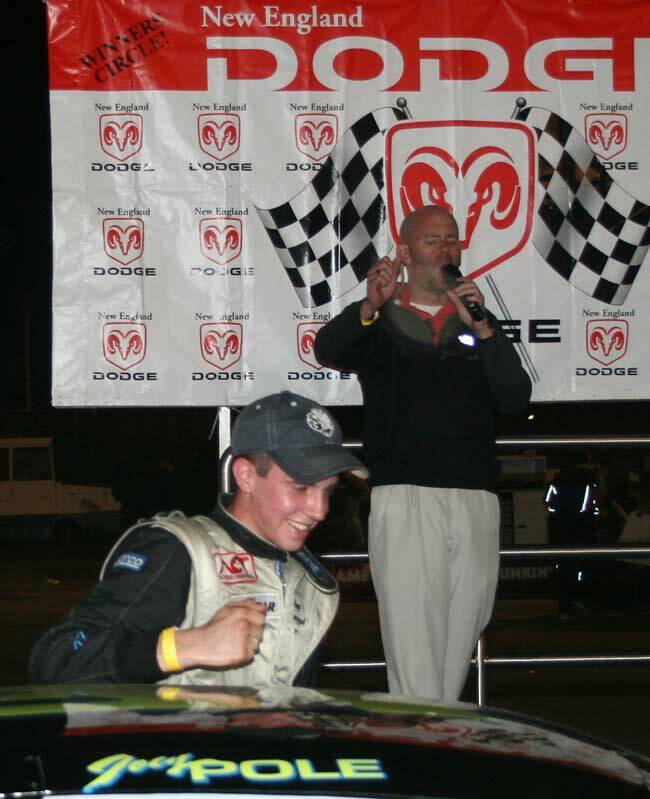 He took command on lap 14 after the third and final restart of a wild race. “We just stick it out there and see where we end up at the end of the race,” said Bowie, 18, and a third-generation winner at Oxford. 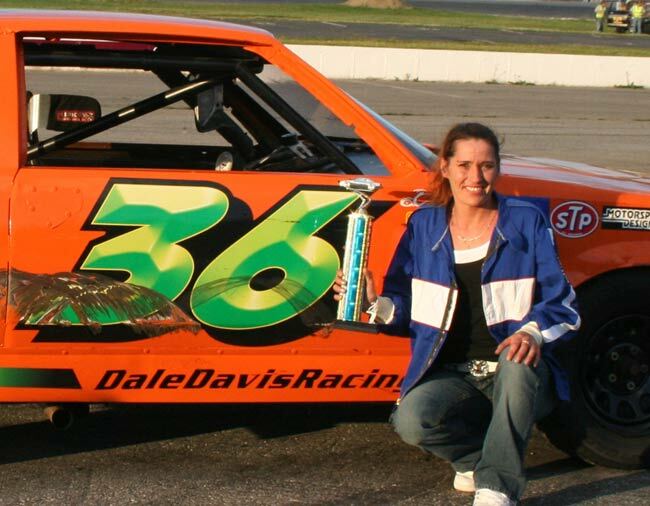 David Childs latched onto Bowie’s back bumper over the final five laps but couldn’t complete the final pass. 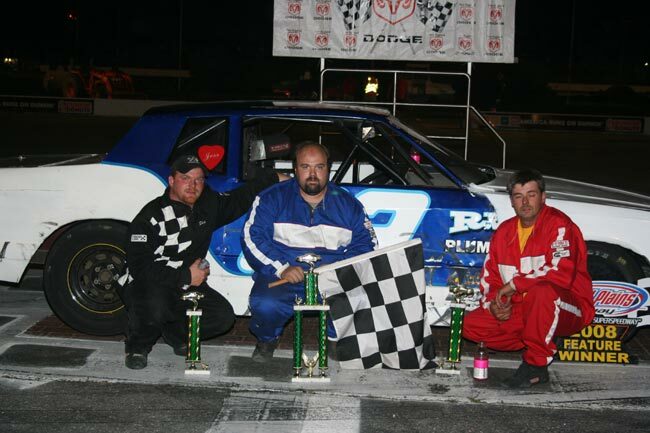 Brown piggybacked his Wednesday win with a third-place showing, chased by Steve Moon and Thom Bell. Patria picked up her second straight victory and third in Agren Appliance Saturday Showdown activity, where she‘s the point leader by a bundle in pursuit of her second straight championship. Christina Spaulding dominated the first half of the event, but Patria closed the gap and put her Little Giggles Child Care/Michael Hemond Construction #34 in position to steer clear when Spaulding had to slow on the backstretch for double-wide traffic. Spaulding voiced no complaints or excuses. 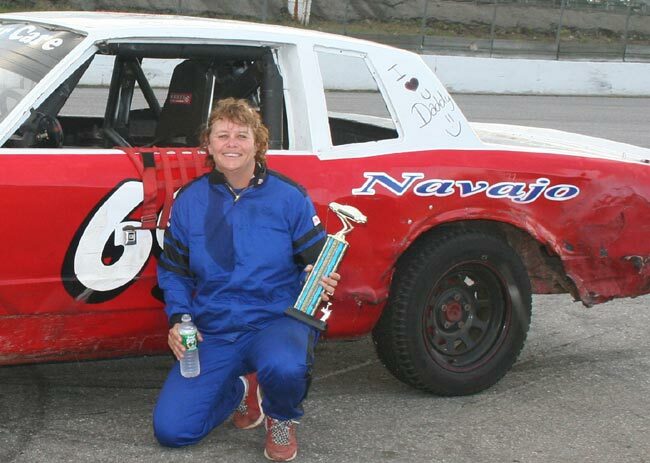 Acceleration Series point leader Cathy Manchester was a steady third. 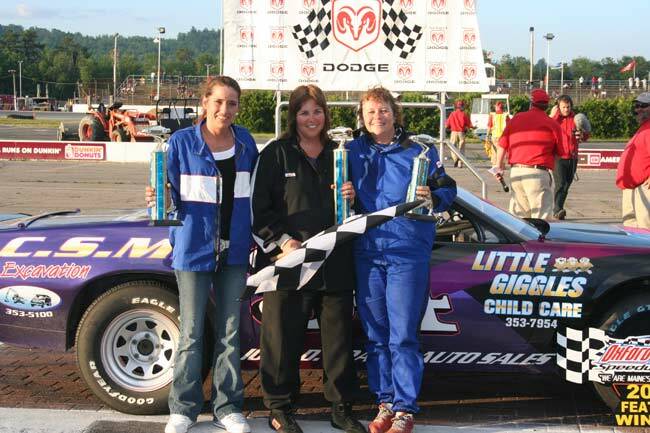 Tina Springer was fourth in her first appearance after a two-year break from the division, with Deanna Bisbee fifth. OPS action continues Wednesday at 6:30 p.m. with the Acceleration Series. Championship Series competition resumes next Saturday, June 28 at 6:30 p.m. 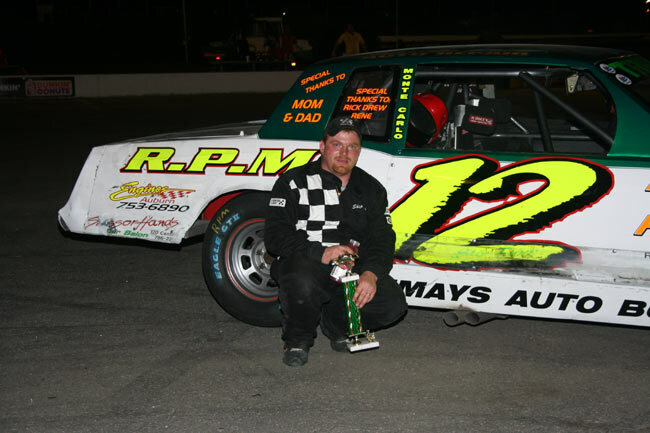 Round one of Unicel Motor Mayhem is scheduled for Friday, June 27, also at 6:30. Lap leaders: Cyr 1-10, Payea 11-52, Polewarczyk 53-150. Failed to qualify: Billy Childs Jr., Daniel Descoste, Leon Heckbert, Stephane Descoste, Phil Scott, Ricky Wolf Jr., Eric Chase, Matt White, Dale Verrill, Mark Childs Jr., Joey Doiron, James Linardy, Donald Theetge, Mark Hudson, Ron Henry, Scott Luce, Gerald Parlin, Bobby Dragon. Lap leaders: Chapman 1-22, Williams 23-30. Lap leaders: Englehaupt 1-3, Brown 4-7, Robitaille 8, Brown 9-13, Z. Bowie 14-20. Lap leaders: Spaulding 1-13, Patria 14-20.